Safeco Electric is an electrical contracting company whose founder, Peter Corish, is an electrician with over twenty five years’ experience in the electrical contracting industry in Ireland, England and the USA. Safeco Electric was originally established in Wexford in 2007 and has enjoyed steady growth even throughout the financial downturn, relying almost exclusively on word of mouth referrals from happy clientele. We feel this is largely due to our commitment to detail, professionalism and high service standards. 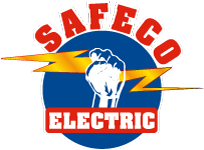 Safeco Electric is a small to medium sized company and are comfortable carrying out all types of electrical works.